Alright! I have finally imported all the posts from this blog over to the new Sewing In No Mans Land. You can now find all my old posts, patterns and random ramblings (what I know you really tune in for eh, eh?) over there. You can also subscribe down at the bottom if you would like with google reader/ friend connect. 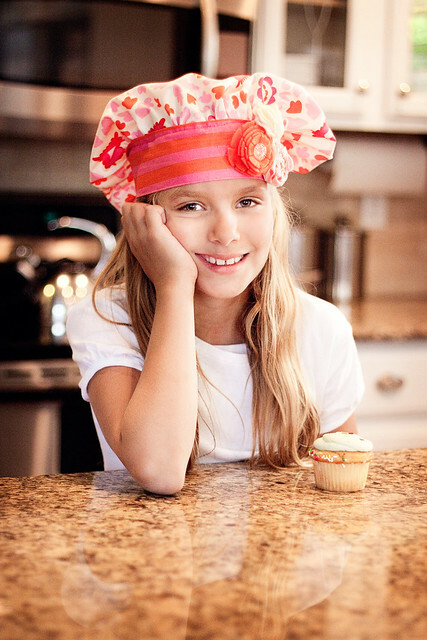 Hope you will follow along because next I will be sharing the pattern for this super cute Chef's hat. Yup, you got a sneak peak here first! Hop on over to sewinginnomansland.com to check out the new tutorial! And there is a giveaway! Woo hoo! Here is a little sneak preview of the post. You need to jump over to see all of it and download the pattern and enter the giveaway! One of the things I often received emails about is having to download page after page of patterns individually, the other is having the pattern pieces themselves be dotted lines to save on printer ink. Well I am happy to say I have fixed ONE of those things and am diligently working on the other. You can download the pattern for Evie's Apron here all in one download! Yeah it was really easy and I am so glad I have fast enough internet to make it easier for ya'll to print patterns :) Once again this pattern is loosely based on Sassy Little Sisters apron. I just feel like this version is a lot simpler and straight forward. I also love that I was able to make each apron out of two correlating fat quarters and some white fabric I had laying around. This was the only way I was able to afford making them all out of either Amy Butler , Joel Dewberry or Heather Bailey fabric :) Evie's (an exact copy up for sale in my Etsy store HERE) was made from some Heather Bailey Fresh Cut fabric that I LOVE. Once you have printed out your pattern, taped it together and cut out your fabric as directed on the fabric, fire up your iron so it is ready when you need it. Ya'll know me and my love of irons ha! 2. Take your two pocket pieces and lay them right sides together. 3. Stitch around outer edge leaving a small opening so you can flip it right side out. I like to leave the opening on the top where it is straight so then it is easier to sew shut. Be sure to bookmark, subscribe and follow the new blog over at sewinginnomansland.com or simply click HERE. This is a copycat post from the new site and probably will not look as good here haa! During my extended break from craft blogging we were able to celebrate Evie's second birthday! Woo hoo! I wanted to do something smaller that the kids would love but did not involve a TON of planning or execution on my part ha! We decided to book a local farm and have the party there. The kiddos would get to milk a cow, go on a wagon ride and get bags of food to give to the animals. The plan worked like a charm. While most of the adult attendees hunkered down in the party room with the yummies, I had a blast just hanging back watching the kids run wild on the farm. We got Evie's cake and cupcakes from The Sweet Tooth Fairy. A local bakery that I attribute 100% with me catching back up to the normal amount of weight I gain during pregnancies. They are just around the corner and open way to late ha! Everything else was purchase from Shop Sweet Lulu. Oh my goodness, do they have THE cutest party items. I especially love the pushpop treats and glass bottles. We filled them with mini cupcakes and chocolate milk perspectively, yum! Evie, being 2, isn't in the swing of the whole birthday thing and refused to blow out her candle and then was shaking with excitement while opening presents. This time I had become wise to the fact that it is virtually IMPOSSIBLE to be a mommy running a birthday party AND get good pictures if you are the photographer. I either run around and never get to talk to guests and friends because I am behind the camera the whole time, or walk away with only a picture or two proving there was a party ha! Luckily my favorite photographer, Leah Miller, is here in UT and she was willing (even though she had JUST had a new baby two weeks previously) to come and document the excitement. She did SUCH an amazing job! That is how, for the first time ever, I am in a picture at my own cuties party. Granted I am sweating bullets and over 8 months preggy, but hey, I'll take it! I thought it would be cute instead of party favors to make all the attendees little "milk maid" aprons. The boys got a bit short changed in this aspect of the party but to be honest I don't think they noticed. In a rare twist for me I purchased a little apron pattern from a company I am thinking (and hoping) is a momma sewer based company. I must admit after making one I had to tweak several things and in the end just made my own pattern. If you would like to purchase the original pattern, you can do so HERE (where it is a few dollars cheaper then at the fabric boutique I bought it at). The company name is Sassy Little Sisters and I believe they have a line of patterns to choose from. Or you can come back and download the pattern I created and follow along with my tutorial that requires only two fat quarters, some plain white fabric, a bit of velcro and two buttons! I always love supporting other mommas so please check out the original pattern here and jump on over to Leah's site if you are in need to to die for pictures, which come on, who isn't? Here it is folks! The BIG news! After lots and lots and lots of work Sewing In No Mans Land now has a .com!!!! I am so excited about the new site! I hope you will take the time to jump on over HERE or go to sewinginnomansland.com/blog/ and check it out. There are some fun announcements and fingers crossed a fun new layout. I will post a copycat post here for the next bit just to ease people into it. My hubby is concerned that readership is going to drop like a rock ha!! I would like to prevent that hence the easing into it. Thanks for all the support!! and one star wars tote bag for a little boy who is so excited for school. and her fabulous wedding. So, really quick, funny story about the bridal session I did with her. 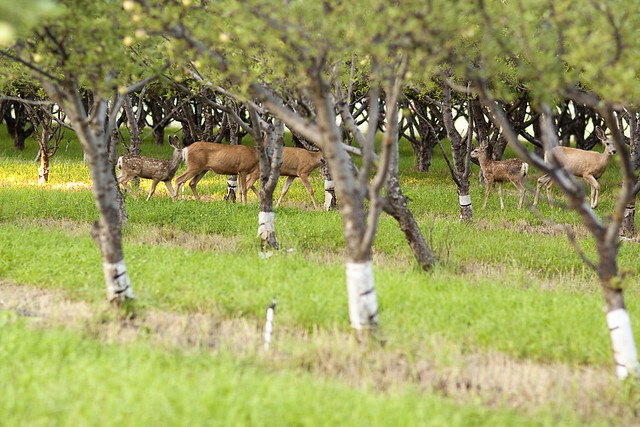 I have being DYING to do a photo shoot in a fabulous orchard but have never been able to find one. I see them in pics all over the place and finally after some serious internet scouring I figured it out. What we didn't count on was the overwhelming number of deer that would be wandering about. Well, apparently my lil 'sis has a fear of deer and just about died when a good 25 of them started stampeding towards us.